I routinely walk on a treadmill at least twice a week – both at home and in the gym, and as an avid multi-tasker, I always read while walking. When I bought a treadmill for my house, it came with a reading rack that seemed fine at the store. However, once it was delivered, I realized the treadmill’s rack was too far back (or I was too short) and it just wasn’t going to work. 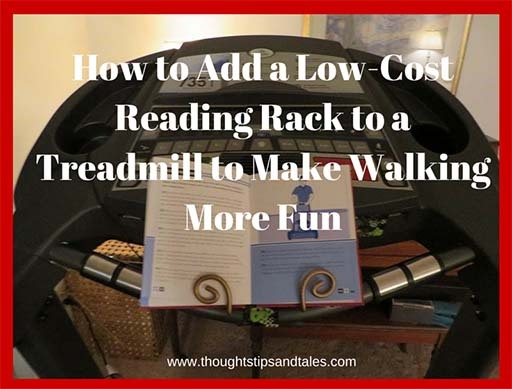 I did some Internet research about various types of reading racks to attach to the treadmill, with the intention of buying one — but couldn’t find anything suitable. Finally, I rigged up my own rack and it makes reading while walking a breeze. Tape the plate holder securely to the front of the treadmill so books are held upright in a comfortable reading position – and, voila! You have a low-cost reading rack that’s secure and works like a charm. If the book doesn’t stay open and flat, clasp the tops of the pages on the left and right side with a clothespin or large clip. This entry was posted in bargains, bike rack, diy, do it yourself, fitness, health, life, reading rack, saving money, thoughts tips and tales, timesavers, treadmill and tagged bike rack, crafts, DIY, do oit yourself, exercise, fitness, health, make it yourself, reading rack, thoughts tips and tales, treadmill. Bookmark the permalink.